Pavers are extremely decorative, versatile and durable landscaping and construction materials that are extensively used in residential and commercial properties across the Greater Palm beach areas. Pavers could be made of brick, stone or concrete and are very long-lasting. But they too require regular maintenance. In cases of damage to excessive wear and tear, paver repairs will have to be carried out. The important thing is to hire an expert contractor like AAA Pavers Inc for this work. We will source the best materials that match the pavers that already exist on your property. The work will be carried out to perfection and we will also ensure that the rest of the pavers do not get unsettled in the process. 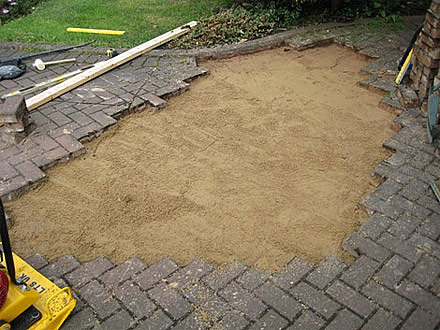 Since pavers are installed on compacted sand, the repair work is largely about replacement of the pavers or leveling of the base material. Though this might seem like a simple job, it is crucial that paver repairs be carried out on a priority basis. Settling & Shifting - This could be causes due to the wrong base material being used or the base material might not be deep enough for the kind of soil that exists on your property. Cracking - Though pavers are very strong, there are times when some contractors use cheap pavers that are made with sub-standard materials. If undue pressure is put on it and very heavy vehicles move across them, there is a danger of cracking. We will be able to replace these cracked pavers for you. Spreading - This issue generally occurs when then the edge restraints are inadequate or loose. Even poorly-laid brick patterns or the use of the wrong kind of jointing sand can create issues and the pavers might break the bond lines. 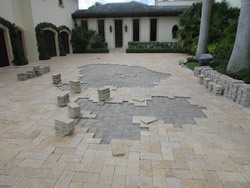 If you need any paver repairs in your home in North Palm Beach, Lake Park or Riviera Beach and the surrounding areas, simply drop AAA Pavers Inc a line via the form on our website and we will contact you as soon as possible and provide you with the best quote.